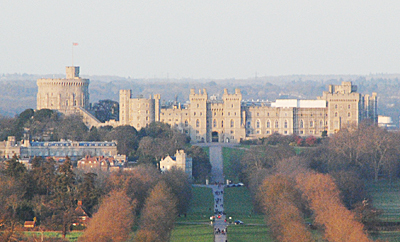 English Heritage are celebrating 150 years of the blue plaque scheme this year – the oldest of its kind in the world – and so to celebrate we’re looking at 10 of the most notable among them. First up, it’s the oldest surviving blue plaque. 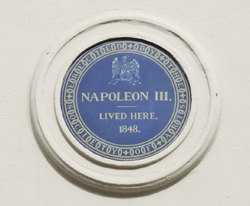 Located in King Street in Mayfair, just off St James’s Square, it commemorates the last French Emperor, Napoleon III, who lived at the property while a prince in 1848. It was only a brief stay for the then soon-to-be emperor. The nephew and heir of Emperor Napoleon I, he , like other members of his family was exiled from France after the Battle of Waterloo in 1815 and spent the following years in various other countries in Europe as well as, finally, London where he lived firstly at Carlton Gardens and then at the King Street property. He took the lease on this newly built house in February, 1847, and created what English Heritage has called a “shrine to the Bonapartes” inside, displaying such relics as Napoleon I’s uniforms and a portrait of his famous uncle by the celebrated French artist Paul Delaroche. The prince was something of a society favourite during his time in London and was invited to join various of St James’s clubs and apparently even enrolled as a special constable during the Chartist riots of 1848. When the Bourbon monarchy – in the person of King Louis Philippe – was overthrown in France in September that year, the prince abandoned the house to rush back to France (apparently in such a hurry that the story goes that he left his bed unmade and his bath still full of water). The prince was elected first President of the Second Republic on his return to Paris and in 1852 took his place as Emperor Napoleon III on the restoration of the empire (incidentally, he ended up returning to England in exile following his defeat in the Franco-Prussian War and died in Kent in 1873). The plaque, installed in 1867, also has the distinction of being the only one installed while the person it commemorates was still alive. The rule now is that those commemorated by a blue plaque need to have been dead for at least 20 years before the honour can be bestowed. The plaque, which is rather more elaborate than modern versions, was put up by the Society of Arts (they’re mentioned on it) and the design features a French imperial eagle. It was manufactured by Minton Hollins & Co.
For more on Blue Plaques, see www.english-heritage.org.uk/visit/blue-plaques/. 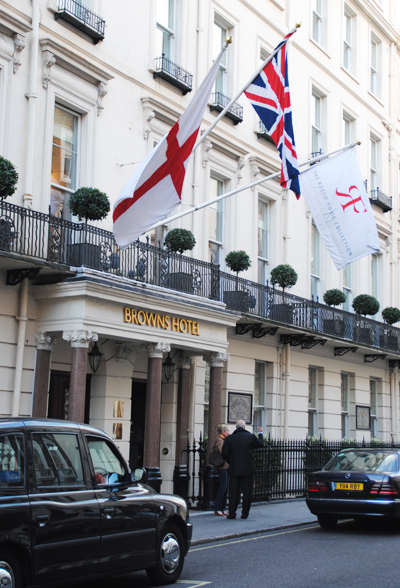 Brown’s Hotel in Mayfair (now officially the Rocco Forte Brown’s Hotel) is generally awarded the accolade of being London’s oldest hotel. The hotel, which initially fronted on to Dover Street, was founded in a series of former Georgian townhouses in 1837 by James and Sarah Brown, formerly valet and maid to Lord and Lady Byron. 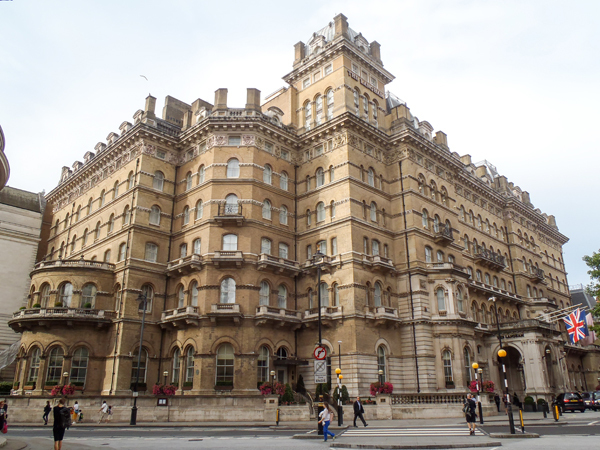 After being sold to the Ford family in 1859, the hotel was extensively modernised with electricity, the installation of permanent bath tubs, lifts, and in first for London hotels, an on-site restaurant. The building itself underwent a major expansion in the late 1890s when the family bought the St George’s Hotel which backed onto Brown’s and fronted onto Albemarle Street. 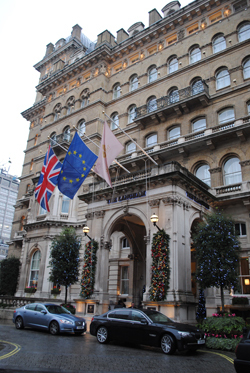 The two buildings were merged into one, an extra floor added, and a new facade built for the hotel facing out onto Albemarle Street (pictured right). Three further townhouses were incorporated into the building in the early 1900s. Possibly the most notable event to take place at the hotel was in 1876 when Alexander Graham Bell made the first ever telephone call there. Other visitors included authors Rudyard Kipling (who wrote The Jungle Book while resident) and Agatha Christie (At Bertram’s Hotel is said to be based on Brown’s), royalty such as Queen Victoria and the French Emperor Napoleon III and his wife Empress Eugenie (they stayed in 1871), and world leaders like US Presidents Theodore Roosevelt and Franklin Roosevelt, British Prime Minister Winston Churchill (said to count the bar among his favorities), Cecil Rhodes, founder of Rhodesia, and Emperor Haile Selassie, who took refuge there in 1936 after the Italians invaded Ethiopia. The hotel, which now features 117 guestrooms, underwent a multi-million pound refurbishment in the mid-Noughties after becoming part of the Rocco Forte Collection of hotels. As well as The Albemarle restaurant and The Donovan Bar, it also serves award-winning afternoon teas at The English Tea Room. For more about Brown’s Hotel, see www.brownshotel.com.